One fashion accessory that will never go out of style as long as you have enough style to wear one, is the cowboy hat. Romping around town in this Western wear staple, however, takes a little more thought than simply plopping one randomly on your head. Pick the right size. Measure your head by placing a measuring tape around your crown. If you don&#x2019;t have a flexible measuring tape, use a piece of string and then gauge it with a ruler. For best results, try a hat on before buying to ensure it does not sit too high atop your skull or flop down and cover your face. If in a pinch, you can use a strip of cardboard around your crown to make the hat a little smaller. Fix your hair. Make your hairstyle accommodate the hat without any bulk, bulges or strange growths sticking out from under the hat. Slick your hair back, comb it down, flatten the top enough to curls spill out under the brim or wear a low pony tail. Make adjustments. Angle the brim and front of the hat downward just a tad at a slight angle over one eye for that mysterious Western look. The brim should be curled up on the edges and flat at the front in back. Pair it with jeans. Cowboy hats look grand with good ole denim and basically any type of shirt, from a dressy silk to a simple T-shirt. Dress it up with a dress. Flowing, short sundresses go well with a cowboy hat, as do long, lean skirts and a simple blouse. Don&#x2019;t pair cowboy hats with prairie skirts or anything with a horse print or you will look like a novelty shop mannequin. Suit up. Taking a cue from businessmen in New Mexico, you can also pair a cowboy hat with a suit and cowboy boots. Stunning. Invest in a good quality hat because it's going to be the center of attention when you wear it. 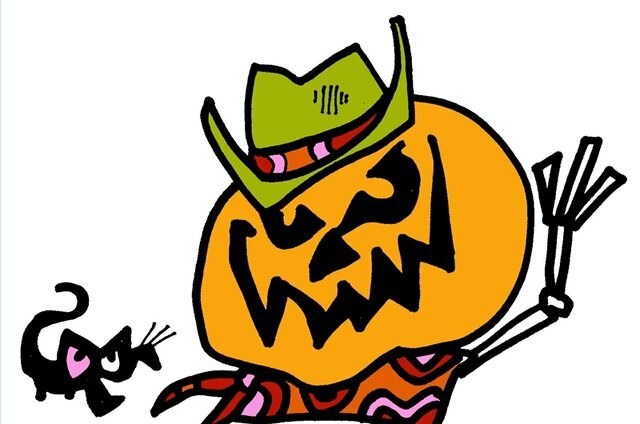 Don&#x2019;t wear leopard print, zebra stripe, velvet or hot pink cowboy hats unless it&#x2019;s part of your Halloween costume.